Dave, "Gitmo is in the news and it brought back some old memories. I'm sure any Sailor who has been there would remember it also. 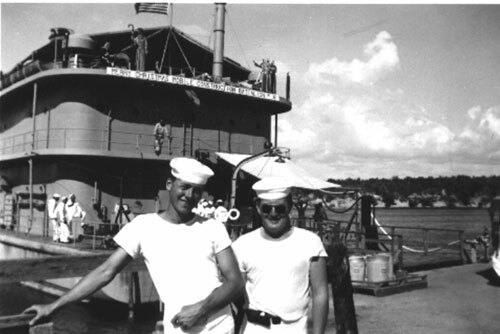 In December 1951, our Sea Bee Battalion sailed from Quonset Point for Cuba. It was a harsh winter in Rhode Island and we were going to the tropics. This wasn't exactly paradise as I was leaving my wife behind. It took a few days as we stopped off in Brooklyn for a short stay. When we finally arrived, we were to live on an old hospital barge, but ate in the base mess hall. Sleeping in the tropics means no blankets and lots of cool showers. The majority of the boat was given over to steel frame bunks stacked 4 high with canvas stretched with rope to hold it to the frame. You didn't want the top bunk, although others wouldn't step on you getting in because there was no air-conditioning, only ships fans. After a few nights your body stretched the canvas enough to fit your contour. I began to enjoy this living because the base was first class complete with a bingo hall and outdoor movie theater. The food was the best I've had in the Navy, probably because the C. B.s didn't have good cooks. I worked in an outdoor carpentry shop on shore which had a large canvas roof. We usually had a small rain shower each afternoon. We built clothing lockers for enlisted men's quarters. The civilian carpenter's union got all the good jobs. I read a lot and wrote letters home at night. I missed Marilyn !!! There were advantages though; we were able to see Bob Hope and his troup of actors, watch the USS Missouri battleship pass by, and received an invitation to play basketball in the All Navy Tournament in Norfolk. I was able to hitch hike home to Normal to see my wife. I returned to Cuba via an old Destroyer which ran into a hurricane. I also saw a couple of friends visiting Gitmo on a Carrier. Now I can only hope our Afghan detainees are enjoying their visit. Maybe they will let them use the golf course, have access to horses to play "goat polo", and use skuba gear to snorkle the crystal clear waters. They would certainly have a memorable story to tell the folks back home, enclosed is a snapshot of our APL home with a merry Xmas note attached. Anyone have recipe for Jumer's rolls? I just read Tina Hartzler's recipe for Monkey Bread and was wondering if anyone that has the recipe for Jumer's Rolls would submit it to the Recipe of the Week. I enjoy Minonktalk and all its catagories. Hi Dave, I have bought my groceries at the new store twice now. I am impressed with just the way things are displayed. Its so interesting and easy to spot things the way they are on the shelves and the display areas on the floor do not take up all the room so that you can't even get around them. The staff look so nice, neatly dressed. I am told I am an optimist, and that is true, but I have high hopes for the store. If they keep up the good work, more people will come. When something is new it takes awhile in all the small towns, this I know. I for one will do my shopping there in order to support it. The prices are a little high, but hope they too will get better once there is a routine and the new owners can tell what's what better. Anyone hear of the "Orphan Trains"? Enjoy the 'minonktalk' site - it was just brought to my attention about a month ago. I too enjoyed the story about the mules and the jumbo. I never had the privilege of climbing them - but did get up close to one in Roanoke. When I was growing up in Secor in the 50's - they used to shoot off the fire works from there and if the sky was right - we could watch them from our porch at home. Maybe it was my dad's way out of having to take us there and my older brothers and sisters didn't have to take us along with them. I thought I'd like to ask if any of your readers might have ever heard of the Orphan Trains coming from New York City and stopping in the Wenona, or Streator area. My grandfather - known as Gus DeVoe came on the Orphan Train about 1870-1873. We are not sure. He lived with the Jacob Scheirers for a time, and then went out on his own. Eventually, he went back to NYC and brought my grandmother to the area of Wenona, Leeds, and Streator. They went to homestead in the Oklahoma Panhandle in December 1905 - and I believe a group went with him. (They only stayed 3 years!) There was also a group from Streator that went - they were known in Oklahoma at the 'Streator Colony'. Before 1905, my grandfather owned a tavern in Rutland. It is the only picture we have of him - standing at the end of the bar. I am going to try to get a copy to you to see if anyone else may recognize it. He also owned a tavern in Toluca, but things were a bit rougher there - and the story was told by my aunt that her mother held a would-be robber at gun-point for an hour, waiting for the sheriff to come and take him away. My grandfather then sold the saloon and bought an 85 acre farm and they sold vegetables to a canning factory. Now, that is the way my aunt told the story - she remembers their lunch was the cucumbers they ate in the fields - they sold the cucumbers to a pickle factory somewhere - Streator? It was that farm they sold to have the money to go to Oklahoma. He wrote back to the STREATOR FREE PRESS about the disappointments of settling there - we have a copy of the newspaper article that was printed in 1906. They came back to Illinois where my grandmother died at Washington Illinois in 1909. After that my grandfather moved around a lot and was eventually hit by a train - we think. We could never verify that part of the story. We checked old newspapers and were shocked to see how many train accidents there were back in those days. Thanks for listening, and thanks for the website! Dave, please pass on my highest regards to Jari Lyn Oncken for the very interesting report on the old "opera house". I love stories like this and hope she will continue doing research and telling great tales of Minonk history. Just a comment - yes, its disgraceful how the only state champion athletic trophy in Minonk history was damaged. However, there still remains a huge number of items that were not found. Namely, where are all the band and chorus plaques that used to line the band room? There were probably 50 or more of them when I was in school 20 years ago. What about things like the John Phillip Sousa award which was given to the top member of the band from each year? In my opinion, Minonk has only had a few good athletic teams throughout its history. Clearly it has never been a "dynasty" school, where going to state was a tradition. However, the music department was always strong thanks to the likes of Rex Benson and Elaine Cunningham. From about 1977 to 1987, the band (and chorus) were always strong, placing well at ISU Band Day and other competitions. As you saw, the bulk of the trophies you had in your pocession was band trophies - not athletics. Just think of how many band trophies and plaques are missing given the number that you found. If anything, the school system has disgraced itself by ignoring the great achievements that have been accomplished in the past, especially those of the music department and academics. The idiots that voted for the school consolidation, end of the MDR heritage, and wanton destruction of the school trophies should feel ashamed of themselves, but I doubt they have the sense or accountability to understand and accept what they have done. Hi Dave, Sorry I missed the disbursment day. It was my wedding aniversary and we were out of town. You asked for ideas so here goes. If there are local people that match the trophy years, perhaps they could be persuaded to keep a few and take to their respective class reunions to see if anyone travelling to the reunion are interested. Is there a list somewhere of the "whole" ones that could be published on MinonkTalk? I only wish I had played on a team that won a trophy. Martha Lyons was asking about the Orphan Trains. There is a book titled "The Orphan Trains-Placing out in America" which was written by Marilyn Irvin Holt. It was a Bison Book copyrighted in 1992 by the University of Nebraska Press. Bloomington is mentioned twice in the book, but not Streator or Wenona. There was much "placing out" activity in the Central Illinois region. Charity organizations were established in many of the large eastern cities as New York and Boston. Children were taken from the slums into the organizations. Some of the children were on the streets with no parents. The parents may have died, been put in prison, or just couldn't feed the kids. Other children were given up by their parents willingly. The parents wanted a better life for their children than the slums in which they were living. A company of children, mostly boys, from the New York Juvenile Asylum, will arrive in ROCKFORD, at the Hotel Holland, Thursday morning, Sept. 6, 1888, and remain until evening. They are from 7 to 15 years of age. Homes are wanted for these children with farmers, where they will receive kind treatment and enjoy fair advantages. They have been in the asylum from one to two years, and have received instruction and training preparatory to a term of apprenticeship, and being mostly of respected parentage, they are desirable children and worthy of good homes. They may be taken at first upon trial for four weeks, and afterwards, if all parties are satisfied, under indenture,--girls until 18, and boys until 21 years of age. The indenture provides for four months schooling each year, until the child has advanced through compound interest, and at the expiration of the tern of apprenticeship, two new suites of clothes, and the payment to the girls of fifty, and to the boys of one hundred and fifty dollars. Those who desire to take children on trial are requested to meet them at the hotel at the time above specified. Much of the "placing out" was done in the last half of the 1800's. These must have been brave children to endure this upheaval. I suspect many became self sufficient early in their lives. The children did get out of the slums and went on to build America. One might call this--How The West Was Won. What about subsidies for retired salesmen? Sure enjoyed your article in Minonk Talk on the wonderful checks some farmers receive. Can you tell me who in the Govt. I should contact for such a program for retired Salesmen? Hell, I can use that kind of help. Bob Bastic in AZ, along with Bob Cufaude, and U J Schneider, who were all in Sales. Your editorial on farm subsidies has to be the best I have ever read. I agree with you 100%. I am a libertarian and believe that Government makes everything worse and should stay out of free enterprise. I do not blame the farmers for taking advantage of the subsidies I do blame them for politically supporting them. Collecting taxes and redistributing the money is socialism whether the money goes to farmers or welfare recipients. Dad, (Melvin Matter) just showed me a poem you wrote on Minonk, stating the last years events. It is GREAT!!! I really enjoyed it!!! When I was still working, driving 1000 miles a week, I would refuse to buy gas at the station along the interstate. It was always filthy and gross, the garbage cans were always overflowing etc., so I put myself in the habit of always buying gas else where. It nice to know I'm not the only one that notices the litter out there!! I'd have to fill up approx. every other day. That station is by far the worst I've encountered in all my travels! Editor's note: If we have more testimony like your's from other dissatisfied customers, perhaps Mr. Feeney might decide once and for all to clean up the Shell Truck Stop. Thanks for writing. I read the article about the Stoddard family and the tragic death of their two children. According to information that I have found, they later took care of a little girl by the name of Hazel Adams. Would anyone know what happened to her? I have been searching for her family for over 10 years. Thank you . I read your articles everyweek from sunny Arizona. My mother was born in Minonk in 1910. The family names are Adams, Willard, Kaminski, Lutomski. Thank you for your time. Im in the searching mode and perhaps you could print this for me. Many years ago, between graduating high school and moving to Los Amgeles, I lost all my H.S. Annuals. The years were 1945, '46, '47,and 1948. The early ones were very primative as they were mimeographed on standard paper. There were pictures that I supplied and I did some cartoons for inclusion on some of the pages. If anyone has any or all and is willing to part with them, I would be happy to pay for them as well as postage. I can be contacted by E-mail or letter.